Sometimes, having a blog feels like having homework. Setting yourself the task of making a pie every month is one way to ensure it does. I will not be making pie so regularly in 2011. No(pie)vember excluded, I have done all right, I suppose. Some months I was late with my assignments, and other months I got ahead and posted early. What did I learn from the whole experience? Well, this is going to upset some readers, but it needs to be said. So get get ready. I don't want to talk about the potatoes. Pie is not that great. It's OK, but nobody is ever blown away by it. Ever. You can bake a cake, cook a steak, make jams or chutneys or even turn out a batch of home-made sweets and people will be infinitely more impressed than if you made perfect pastry and filled it with something delicious. It should not be this way, since all of the above involve considerably less time and effort than making a pie does, but sadly, I have found it to be so. Sorry to upset you all. I can try to lighten the mood by giving you a recipe for perfect short-crust pastry this time. It is the result of my year long pie project, and I hope making it will make you feel as if it was all worth it. Not that it was you who had to do it, mind. Has the experience of pie making changed me? Well, no. I still get Mr. Other P to make the pastry whenever I need it. But I made all the pastry for the pies you see on here (save this month's mince pies, actually, but let's not obsess), and I did learn to love my nail brush in 2010. You can see all the Pies of the Month here. There's no pie for November, but I have over the year made more pies than the ones I posted anyway so you can just imagine something that took lots of effort and went largely unappreciated. For 'tis the way of the pie after all. This is my last post for 2010. There should have been more. When life gets busy, the blog suffers and I feel bad about it. But make sure you all come back next year. We're doing lamingtons again! Have a Happy and Joyous New Year! Rub the cold fat into the flour. Stop when you have a crumby looking mixture, and can no longer bear to rub fat and flour together between your finger tips. The latter will probably happen first, so push yourself a little. You can do this. Beat the eggs lightly and stir into the crumb mixture to make a dough-like pastry. Form the mixture into a couple of balls, wrap in cling and chill until needed. Roll out on a floured surface and use as you wish. This amount makes enough pastry for 24 medium sized mince pies, or one double crusted large pie. Bake the pastry at 200°C until golden brown and crisp. I am not a carrot cake. 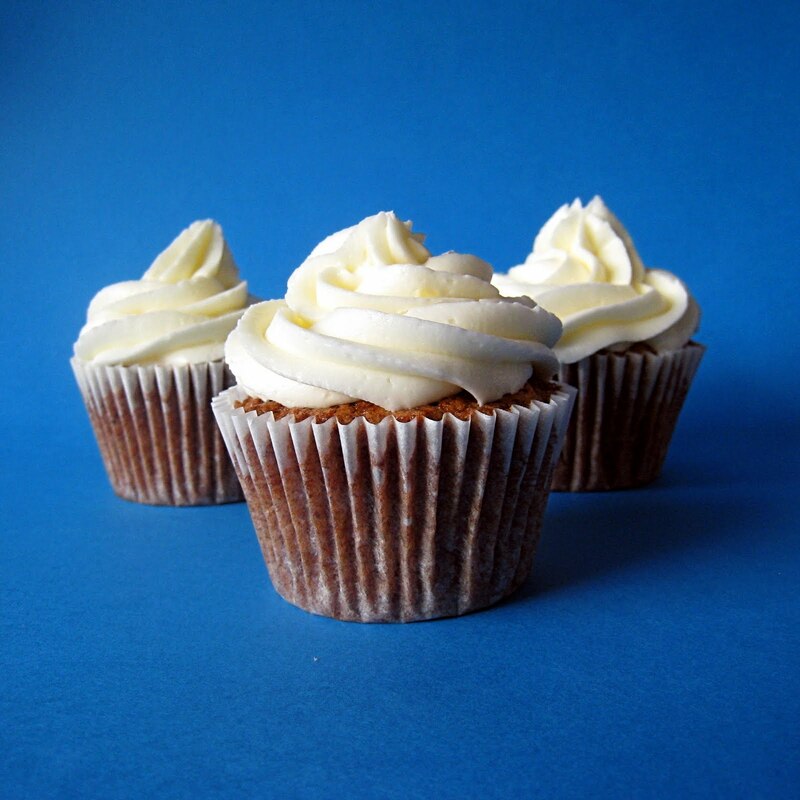 People tell you that carrot cake was invented to use up gluts of carrots. I don't know if that is true or not (and we'll never know), but I figured that since I didn't have any carrots in the house recently, I could substitute a pumpkin and still get away with it. We had three lined up on the kitchen window sill, see, and I was worried I would have to dust them if they stayed around much longer. I do dust. But not squashes. As it happened, I didn't walk away from the experience entirely free of regret (I mean, have you ever tried grating a whole pumpkin with a box grater? Well, don't. ), but that's fine; I take immense pleasure in celebrating my autocracy. Flavour wise, though, pumpkin was a good choice. As was following Rose's recipe. Have I ever made so many recipes from a single volume? I doubt it. They should call her 'The Cake Lady', if they don't already. For until you've added cocoa to the batter mix (and, let's face it, changed the carrots for pumpkin), well, basically you just don't know. So there. I made one full quantity of Rose's recipe and was delighted to find that it made enough for me to make one big cake to take home to the family for the weekend (12+ servings), and a tray of 12 cupcakes to freeze for later. It's what I'd call an investment. If you're visiting family this weekend, and have a sister like mine (who basically tells me not to bother coming if I'm not bringing cake), I recommend you seek out that box grater and get the oven on. Pre-heat the oven to 180°C and grease and line 2 x 24cm cake tins, or make one cake that size and use a 12 hole muffin tin for the rest of the mixture. In a large bowl, place the flour, salt, bicarb, baking powder, cocoa, cinnamon and sugars and mix gently together with a wire whisk to ensure the leavenings are evenly distributed. In another bowl, mix the oil, eggs and vanilla. Add the wet ingredients to the dry, and mix thoroughly. Then fold in the pumpkin (or carrots), and divide the batter amongst the tins. Bake for about 45 minutes, or until a toothpick inserted into the centre of the cake comes out clean and free of crumbs. The cupcakes will take about 30 minutes only. Frost the cakes when cool with white chocolate cream cheese frosting. Remember to lick the bowl. Who got rather carried away with the Christmas theme when photographing today's macarons? Nobody. I see nothing over-the-top whatsoever about these photos. What do you mean? better since you can't see them so well! Curse those lumpy shells! 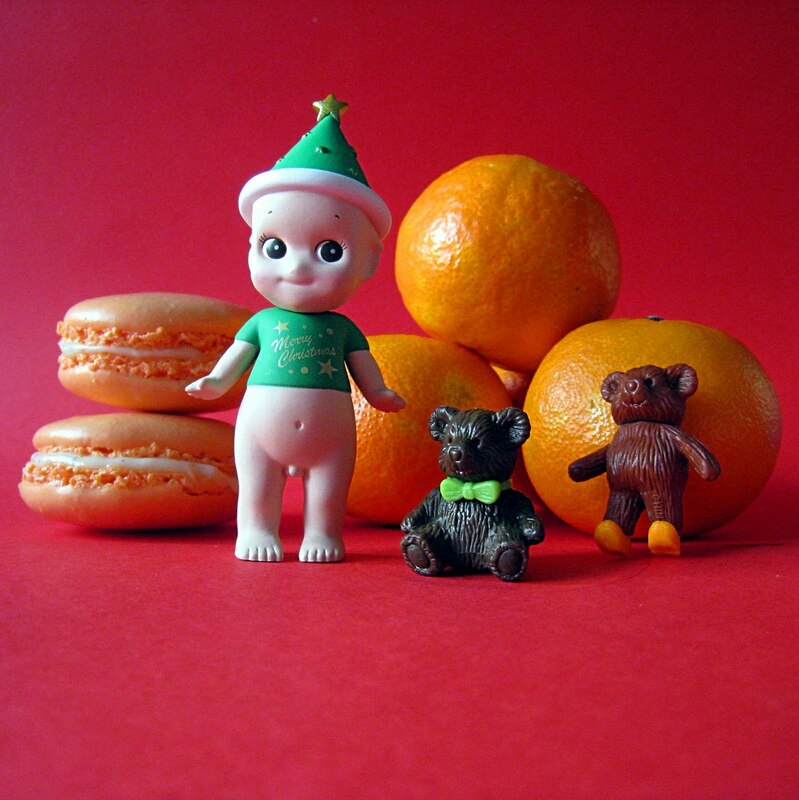 Well, it is almost Christmas time again and that can only mean one thing at Delicious Delicious Delicious: it's also Kewpie time. For all ye faithful that were here last time, you'll know exactly what I mean. For any newbies, I should like to refer you here. Expect some kitsch. Today's post is going to embarrass me, and not just because it features naked from the waist down Kewpies. No, it's going to show me to be a fool who doesn't do his research properly. Fortunately however, this fool who doesn't do his research properly is able to make super-delicious Orange and Clove-Scented Macarons for the festive season. So I give my permission to all of you reading to laugh heartily at my woeful ineptitude. I won't even notice - I'll be enjoying tea and macarons. I love this photo, despite it being out of focus. 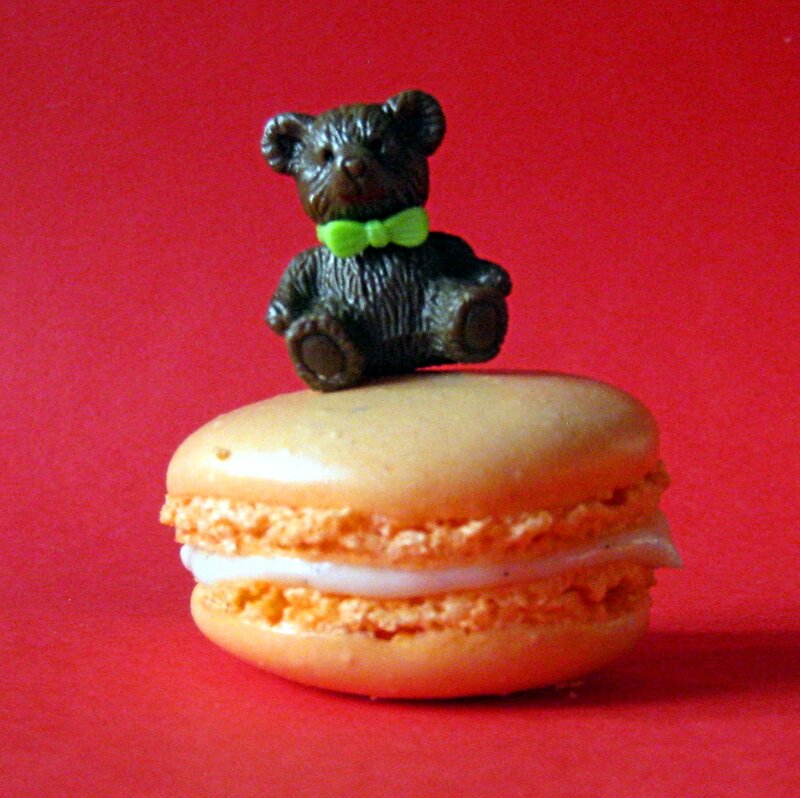 Why aren't all macarons topped with bears? Today's post, you see, is my entry for the 'Most Wanted Yule-Blog Bake Off Challenge'. Yep, never one to turn down a food-related contest (I dream of entering a Pie Eating one, but so far haven't seen any happening in South Wales), and always ready to receive John Lewis vouchers, I got straight into the kitchen upon hearing about the competition. Entrants are supposed to come up with a recipe that really epitomizes Christmas. I know I may be pushing it with macarons, which are not considered even remotely Christmassy in the normal run of things, but hear me out: I love making edible gifts at this time of year, and macarons are perfect for that. They are sweet and luxurious (admit it: you'd never make them for yourself); they last a good week in the fridge (so you can make them ahead); they are easy to package prettily (have you ever tried wrapping a bottle of wine?) and can be flavoured in countless ways. There. I have made my case for the macaron. If you're with me, we'll carry on. My family used to run a greengrocers. Christmas means citrus to us. Oranges, clementines, the works. When I think of Christmas, I think of mounds of fresh-smelling fruits and netting machines (that always broke and meant we had to tie the red mesh bags by hand: lovely). It would be wrong for me not to have oranges in any Christmas recipe I created. How devastated I was just now to find that a Christingle hasn't got any cloves on it at all, but instead ribbons and dried fruits. Turns out what I had always thought was a Christingle is in fact a pomander. But give me a chance! Or, at least make my Foolish Macarons. A couple stashed in a jar or little box would be the best present ever, and if you package them in bags of five, you'll get three gifts for the special people in your life out of this recipe, and all in a little under 35 minutes in the kitchen. First of all, age your egg whites. This means leaving them in a bowl, uncovered, in the fridge or on the kitchen counter over night. I know the Health and Safety-types will hate the idea of doing such a thing, but trust me. Next day, whisk the egg whites until soft peaks form. Add the caster sugar and food colouring gel, if using, and beat until you have a stiff peaking mixture. Sift over the icing sugar and almonds, and add the orange zest. Now fold everything together until you have a smooth batter that 'flows like lava'. I hate this description. Basically, fold the almonds and sugar into the mixture as you would flour into a cake batter. It takes me 50-60 fold to get the right texture. See my other macaron posts for more details. Even if you over- or under-fold the batter, you'll get macarons if you weighed accurately. The folding just determines the texture and appearance of the finished shells. 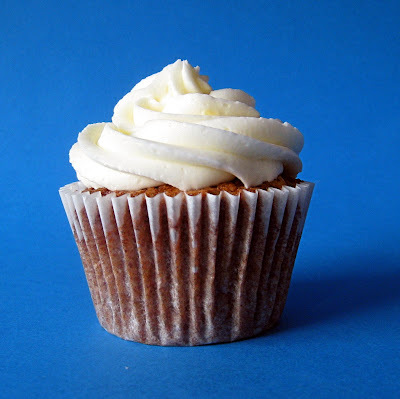 Transfer the mixture to a piping bag fitted with a plain round tip of about 1cm in diameter. Line a baking sheet with parchment, and pipe rounds of batter. You should get about thirty £2 coin sized blobs from this much mixture. Bake at 150°C for 11 minutes and cool the shells on the baking sheet. When completely cold, remove and sandwich with a teaspoonful of the filling. The filling is simple: melt the white chocolate, cool slightly and add the cloves. Then stir in the cream cheese until smooth. You could make a white chocolate ganache, which would be fancier, but the cream cheese filling, though untraditional, is moisture-rich. 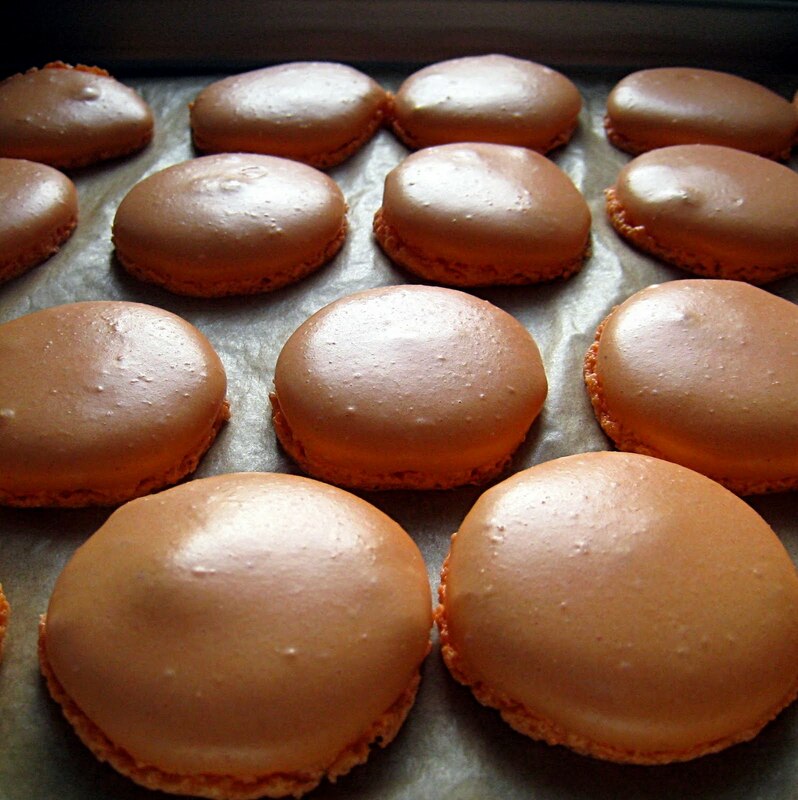 This means that during storage, the texture of your macarons will improve.